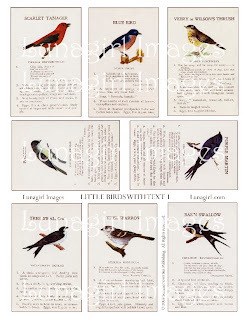 Sweet little bird illustrations, each with a Victorian poem and facts about the bird (type of nests, description of eggs, etc). I've added and removed details to make these just right. See these new digital collage sheet designs at Lunagirl.com, ready to download instantly and use in your projects today.